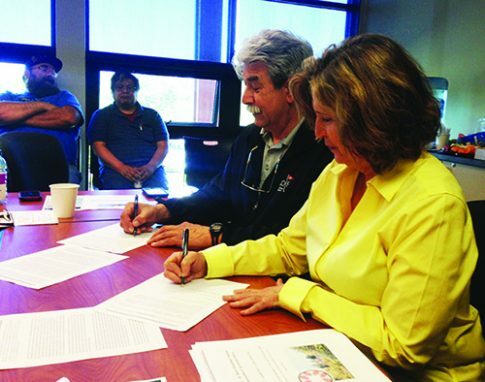 Rear Adm. Keith A. Taylor, commander of the 13th Coast Guard District, and the honorable Timothy J. Greene Sr., chairman of the Makah Tribal Council, sign a memorandum of agreement at the Jackson Federal Building in Seattle, April 12, 2013. 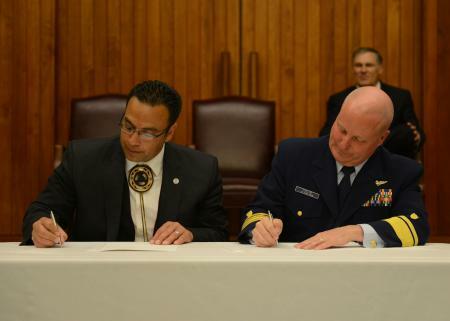 The U.S. Coast Guard and Makah Tribal Council signed a Memorandum of Agreement (MOA) to reaffirm their integral partnership, cooperation and coordination in pollution prevention and response during a ceremony at the Jackson Federal Building in Seattle, April 12. 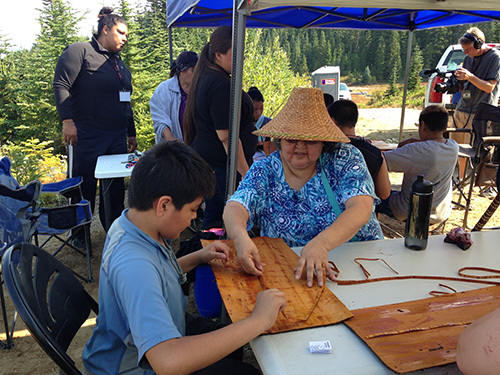 Additionally, the Makah Tribe bestowed a name and dedicated artwork for the primary conference room of the Thirteenth Coast Guard district. For more details about the MOA, see the full United States Coast Guard press release.